Work aims to get people to deal with signs of illness early. A major behaviour-change drive launched by NHS England this week urges people with minor medical problems to see their local pharmacist for advice rather than a doctor in the first instance. The campaign aims to get people to deal with signs of illness at an early stage to prevent them from getting worse. More than a quarter (27%) of those attending GP appointments could potentially be treated elsewhere and about 18 million of these cases could be treated through self-care and community pharmacies, according to NHS England. The campaign seeks to address this by highlighting common health concerns that can be treated by pharmacists. It comes just weeks after the publication of the NHS Long Term Plan, which recommends greater use of community pharmacists' skills. A key message is that people suffering from common problems such as coughs, colds, stomach upsets and aches and pains should visit a pharmacy before making an appointment to see their GP. The activity also aims to raise awareness that pharmacists are qualified healthcare professionals who can offer expert advice, with no need for an appointment. Freuds is working on the campaign, which will run until the end of March and includes TV, radio and social media advertising alongside PR. A film by Freuds features celebrity GPs Dr Hilary Jones, Dr Zoe Williams, Dr Dawn Harper and Dr Sara Kayat, along with NHS community pharmacist Abraham Khodadi, urging people with minor medical problems to go to pharmacists. 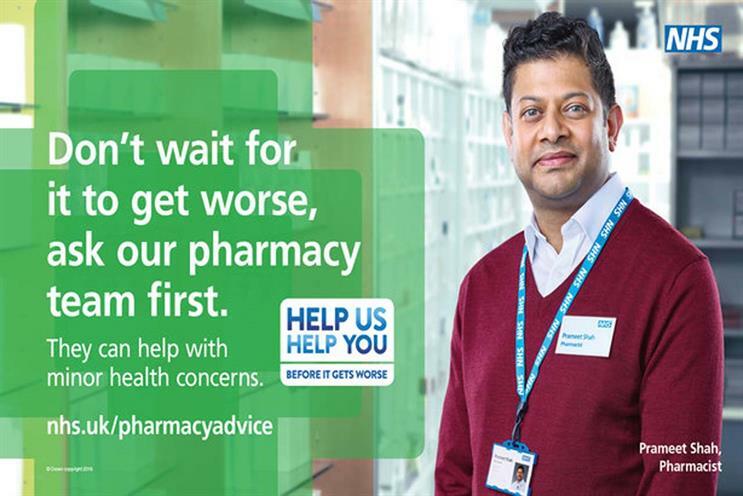 Pharmacies and GP surgeries across England are taking part in the campaign, which is being promoted on social media with the hashtag #HelpUsHelpYou. The Help Us Help You idea – devised by NHS England and Public Health England last year – stresses the importance of people taking responsibility for their own health. Phil Bastable, head of campaigns at NHS England, said: "Community pharmacists are highly qualified healthcare professionals who can offer clinical advice and over-the-counter medicines to effectively and safely manage a range of minor health concerns, such as coughs, colds, sore throats, tummy troubles, aches and pains and many more."